By Mickaila J. Johnston, M.D., Michael Starsiak, M.D. A 38-day-old boy was referred for evaluation of acholic stools and elevated direct hyperbilirubinemia. After 4 days of intravenous phenobarbital administration, a Tc99m-mebrofenin hepatobiliary scan was obtained. Sixty-minute dynamic imaging revealed blood pool clearance of radiotracer and concentration within the liver, but no transit of radiotracer to the gallbladder or bowel (A). 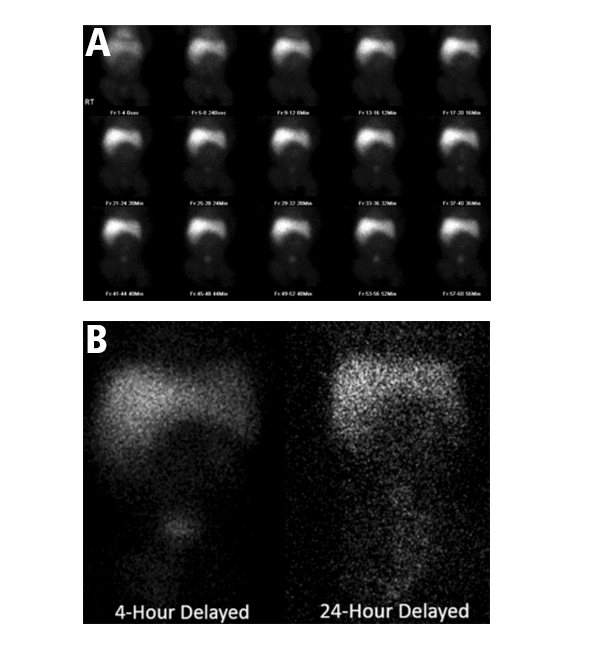 Delayed static imaging at 4 and 24 hours (B) revealed a persistent hepatogram and no transit of radiotracer to the bowel or gallbladder. Incidental vicarious genitourinary clearance was noted, which can be seen with elevated bilirubin levels. Differential considerations for a persistent hepatogram with lack of transit to the gallbladder or bowel on delayed images in an infant include biliary atresia, immature intrahepatic transport mechanisms, and inappropriate (or lack of) pretreatment with anti-cholestatic medication. Similar hepatobiliary scan findings can be seen with complete obstruction of the common bile duct, chronic partial obstruction of the common bile duct, pancreatitis, severe concomitant illness, and hepatocellular disease. Barshes NR, Lee TC, Balkrishan R, et al. Orthotopic liver transplantation for biliary atresia: the U.S. experience. Liver Transpl 2005;11(10):1193-1200. Johnston MJ, Starsiak M. At the Viewbox: Biliary Atresia. J Am Osteopath Coll Radiol. 2016;5(3):28.